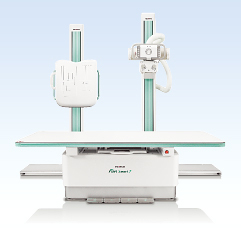 Fujifilm’s latest high-quality, cost effective x-ray system. Easily Installed in limited spaces and easy to use, this user friendly system will bring upon a smart workflow for you. Floor Mounted Tube Stand — lightweight and ergonomically designed. Table — Spectacular load bearing. Upright Stand — Variety of Examinations + Manual Tilting Wall Stand is also available (option) High frequency generator and X-ray tube — 3 types of generators (Capacitor, UPS, Line) can be selected to match your necessity. No power supply modicifaion is necessary for Capacitor and UPS type generator. DR system for general radiography — High image quality is maintained combining with Fujifilm’s “Image Intelligence™” technology. Tube Stand The ergonomically designed floor mounted tube stand provides the technologist with lighter and smoother movement for faster, more efficient workflow. Able to choose between 4-way floating table top(2,200 long × 750 mm wide) and 6-way elevating table (2,200 long × 810 mm wide). Both tables are able to bear 300 kg which makes it extremely flexible for patients of all shapes and sizes.